Made-in-India Dacia Duster coming to Malaysia? Home » Cars » Dacia » Made-in-India Dacia Duster coming to Malaysia? 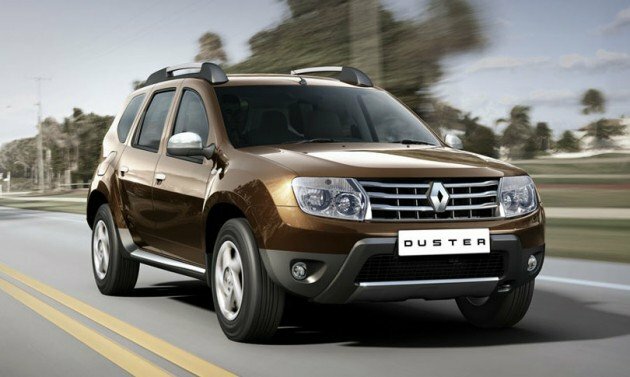 Renault India has announced that it will begin exporting the Dacia Duster (branded as Renault Duster there) to the UK from January 2013. Marc Nassif, MD of Renault India, says that besides the UK, all right-hand-drive countries are potential export markets. Malaysia was mentioned. “We are currently looking at Western Africa, South Africa, Malaysia and Singapore,” he told Autocar Professional. So could we be seeing the rugged Duster in town next year? If that happens, expect the Renault badge on the SUV as the Dacia name has zero presence in our market. Renault owns Romanian brand Dacia, which specialises in budget models like the Logan. In India, the Renault Duster can be had with petrol or diesel power. The gasoline unit is a 1.6 litre with 104 PS and 145 Nm, making a a weak sibling to the two 1.5 dCi K9K diesel variants – one comes with 85 PS/200 Nm while the brawnier THP version offers 110 PS and 248 Nm of torque. The latter also comes with a six-speed manual gearbox, as opposed to five ratios. This or some made in china junk? I’d rather have this. looks like you’ve own one. Its looks like carrying Renault logo?? Perhaps,this is the first sign that Renault will bring in more ‘mass production’ models in to Malaysia/ASEAN..Renault Fluence (petrol engined version) and Renault Symbol could be the next new models introduction..
hope it will sell very cheap here coz i would take this over the Rush or Nautica anytime. furthermore, this is an budget 4wd. Not as luxury as we imagine. Interior Dashboard is very similar to Proton Saga BLM/FLX. With the price i quoted. It should be reasonable. or 17km/L for 1.5 Dci. Looks big, but is just slightly bigger than Vios. Well done, designers, or photographer. My suggestion to TC/Renault Malaysia, price it at around Tiggo price, with 2 airbags and ESC, omit auto-this/that, should be able to sell. this is supposedly a budget suv but i bet the price will be ridiculous when it reaches our shores…thanks pak jib! ok lah I go buy camry tomorrow n u stop telling ppl korean makes are lousy ok? but wait…camry ’99 RM18k…depreciation >RM120k…..why??? RV is bad wat? Duster? What kind of name is that? Their target is to sell to teachers? There lauch 2013 Renault Duster 2.0 in the Gulf. Intro price is OMR 5,390 @ MYR 43,120(OMR 1 approx MYR 8.00) full CBU from India. May be in M’sia the selling price will be around MYR 99,176 including 130% tax from OUR GREAT GOVT. maybe.. Suzuki Alto (Maruti A-star) at India is approximately RM25k, but when arrive Malaysia, It shoot up to RM50k+. When arrive malaysia, hihest possible is at RM80-RM90k-RM100k. with this price. I bet there’ll be hardly any sales. Then we will be enjoying this car reasonably at RM65k – RM75k range. After doing some comparison, owning a car in Malaysia is almost identical to Australia. You have to take into account factors like currency rate, fuel subsidies, ownership certificate, the number of ppl who can afford, highways and roads, toll rates and so on. For eg. If compare wit Singapore, the car costs very cheap but to own it is nearly impossible. You need to buy certificate of ownership that costs thousands of sing dollars and not everyone can get. You cannot stick to one car more 10 years, after that kena buy new car and new cert. Its a way to reduce number of cars in the republic. Then u got no highways to drive ur ferrari at 200km, then fuel price very pricy. Same goes to other countries except different factors. In Malaysia an individual can own 100 cars without restriction, oil subsidize, can still drive a car dat is already 20 years old and can drive like maniac on highways and if get summons just pay during discount.. No prob. The cheapest wud be Brunei but you drive your car mcm dlm compound rumah. Duster name sounds weird in Malaysian context. They should consider name-changing. Duster is very popular suv now in India..The price and quality is good for India . Malaysia Goverment will be impose 130% or 150% tax..so the price will be RM 90,000 to 120, 000..so people wonot Buy Duster for that price tag..pity our self..